Welcome to 2017, a new year of barbershop fun and expectation. The big event, of course, will be our hosting of the Pan Pac Convention in Sydney in September, and the opportunity to meet up with our Pacific brothers from New Zealand, Japan and elsewhere. There’s also a harmony college running straight afterwards, and with the quality of the faculty we’re bringing you, it’s not to be missed. Amongst that faculty will be the Crossroads quartet, 2009 International Quartet Champions. Comprising Fred Farrell (tenor), Mike Slamka (lead), Brandon Guyton (baritone), and Jim Henry (bass), Crossroads are one of barbershop’s most famous quartets, with countless appearances on TV in America and a worldwide following. Their three CD’s are permanently on my “play list”. In addition, we will be host to some very distinguished judges in Kevin Keller and Rob Mance. Kevin is a past Chairman of Judges for BHS, so there’s nothing he doesn’t know about it. He wrote the book! Many of you will have sung Kevin’s marvellous arrangements, so it will be a real thrill to work with, and be coached by Kevin. Rob Mance is the music director of Central Standard, a chorus that has risen from nowhere five years ago to finish second at International last year. Rob will hopefully share with us the secrets behind that success, and then we’ll have no excuse! And there’s more to come than this! During April and May most Regions will be holding their annual regional contests and workshops. These are qualifying events for the National contest (to be held at the Pan Pac Convention), so don’t miss them. All groups (choruses and quartets) must be registered with BHA and all these members must be financial. I have been advised that some of our members have not yet renewed their memberships for this year. Many quartets, and even a few choruses, have not re-registered. In one case I have been reliably informed that they “will renew in time for contest”. I’m sorry, that’s just not fair. Those of you who have renewed are carrying the costs for these members (in terms of insurance policies and APRA performing right’s licences). BHA has fixed costs that must be shared by everyone, not members who choose to come and go as they please. This is exactly why two years ago the BHA Council introduced a re-joining fee for any member who suspends their membership for more than six months. It is not fair that paid up members have to carry these members for free. Of course there is a counter argument that the re-joining fee deters members who might have drifted away from re-joining. That may be so, but I think everybody can understand the principle here - everyone should pay to run BHA, and that’s fair. As we start a new year I would like to take the opportunity of welcoming our new Councillors, Kieran O’Dea (VP Youth Development) and Daniel Beckitt (VP Marketing & Development). Last year I told you of Vocal Evolution’s new show, “Funhouse” to be staged at the Perth Fringe Festival this February. Well it has been an outstanding success. I believe we have put barbershop on the “mainstream” entertainment map in Perth. I know that The Festival Statesmen are doing a new show “Pretty Boys” at the Adelaide Fringe Festival (after a spectacularly successful show last year). So why don’t you try it? Not only is putting on something a little different from a “standard” barbershop show great fun, but it’s a real learning experience for members as well. I highly recommend it! 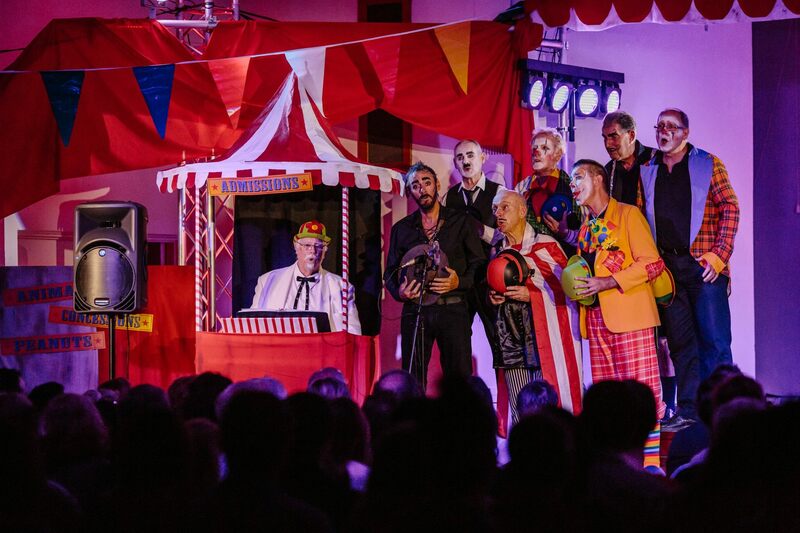 A scene from Fun House, from left: Mike Donnelly, Dave Dannemiller, Gerry Carey, Phil Williamson, Ron Sharp, me (in the yellow), Renne Dewaard, and Lawrence Borle.